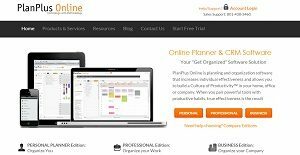 PlanPlus Online is a business management software that promotes a Culture of Productivity™ by improving your planning and organization capabilities, whether you work from home, in the office, or as part of a larger organization. The system is specifically built for professionals and agents working in real estate, finance, and insurance, enhancing their productivity by fusing the highly renowned Franklin Covey business planning methodology to the web, a business practice that focuses on effectively managing time and clients. PlanPlus Online carries a variety of tools that will help users cover major business management facets, ranging from sales automation, CRM, email marketing, collaboration, project management, customer support, and website integration. Since each company has specific business needs, it is advisable for them to desist from searching for a one-size-fits-all faultless software solution. Needless to say, it would be futile to try to find such a system even among widely used software solutions. The clever thing to do would be to jot down the various essential aspects that need consideration such as key features, budget, skill levels of employees, company size etc. Then, you should do your research thoroughly. Read some PlanPlus Online reviews and look into each of the other apps in your shortlist in detail. Such comprehensive groundwork can make certain you discard ill-fitting platforms and choose the system that presents all the features you require for business success. How Much Does PlanPlus Online Cost? We realize that when you make a decision to buy CRM Software it’s important not only to see how experts evaluate it in their reviews, but also to find out if the real people and companies that buy it are actually satisfied with the product. That’s why we’ve created our behavior-based Customer Satisfaction Algorithm™ that gathers customer reviews, comments and PlanPlus Online reviews across a wide range of social media sites. The data is then presented in an easy to digest form showing how many people had positive and negative experience with PlanPlus Online. With that information at hand you should be equipped to make an informed buying decision that you won’t regret. What are PlanPlus Online pricing details? What integrations are available for PlanPlus Online? I enjoyed my paper Franklin Covey planner for years but finally went away from it due to its size. Now I have the empowerment of that effective organizing/planning tool online at a reasonable cost. It supports managers tracking conversations and project completions by assigned the associated employee’s names which helps make evaluations meaningful with more detail and timely since the data gathering is already done for you. I am a 62 yo ‘postmenopausal blonde’ when it comes to computers and yet the mechanics of this software seem logical and easy to use. It is now very affordable as well. The Plan Plus Online representative, Zach, took the time to link my Apple, Outlook and Google calendars so they all see the same items on my iMac, iPad, iPhone and work PC. He then went through the functionality of the software with me and answered all my questions. Having been a Franklin Covey paper-based fan for many years, I was really looking forward to implementing Plan Plus Online throughout our practice. However, the system is plagued by the U.S. dating system (MM/DD/YR), which is fine if you live in the U.S., but if you don’t, it really stuffs up your planning, meeting scheduling, project timing, reminders, etc. when 2 January is recorded as 1 February, etc. throughout your organisation. And, apparently, they cannot cater for logical dating (DD/MM/YR), or have no desire to cater for it – as I have asked several times. Very frustrating. I have therefore had to stop using it. If you need more information about PlanPlus Online or you simply have a question let us know what you need and we’ll forward your request directly to the vendor.